Helen Orchard - Benedict Associates Ltd.Benedict Associates Ltd.
Helen brings energy, enthusiasm and excellence to Benedict Associates and her compassionate spirit and easy-going manner puts people at ease. Helen’s proactive and professional nature elevates the client experience at Benedict. Helen has a BA in Art & Communication and in recent years has completed various leadership training and professional development programmes, including the Being A Leader leadership initiative. 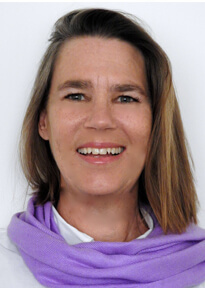 Helen regularly enhances her interpersonal skills through ongoing work with Landmark Worldwide and her heartfelt, engaging approach resonates with those whom she has the privilege of connecting. Helen’s role at Benedict includes implementing marketing and design concepts, diverse projects, coordinating media and PR initiatives as well as managing the office. I truly value all the people I interact with, appreciate the connection I have with the Benedict employees and am invigorated by the variety of opportunities my position offers. Being curious about life fills me with wonder and inspires me to learn and grow. I am uplifted when connecting with others ~ enriched and elevated by my experience of myself and them. Presence, openness and deep listening. Gratitude. Kindness. Integrity. Equity. Love. Fun. The beach . . . every day!